Game of Thrones has a lot to answer for. The last 6 weeks of my life has been a repeat of eat, sleep, work, GoT, eat, sleep, work, GoT. The downside of having completely caught up with the latest aired episode is that I now have to wait a very long, anxious week before I can watch the next episode rather than just flicking it over. I just might DIE! But now that I’m completely caught up and am waiting for the next episode, I suddenly have time to do other stuff than just eating, sleeping, working, and GoT-ing. This freeing up of my schedule just happens to coincide with a lovely warm, dry spell here in Sydney. It’s well and truly autumn (as the Starks would say, winter is coming) and temperatures are still in the mid-20s, around mid-70s℉. Taking advantage of the blue skies and warm weather, this weekend the White Russian and I rode our motorbikes up to the Hunter Valley, around 2 hours north of Sydney. We found a few twisty roads, and also found ourselves on a dirt, unsealed road, which made me feel a bit nervous. While we were in the area, we dropped into Bistro Molines, which shares a scenic spot with Tallavera Grove wineries. If you’re lucky and book ahead, you can snare a table on the verandah which overlooks the valley, marked with rows upon rows of vines. Or if you aren’t so fortunate, the tables inside still have the beautiful panorama thanks to the open dining area, which is filled with lovely fresh cut flowers and warm, rustic decor. We were served a simple but delicious taster of cherry tomato, olive and buffalo mozzarella, and the bread was served with a rich aioli, an interesting but slightly strange change from the usual butter or olive oil. As a starter, we shared the charcuterie platter of a rich, creamy duck liver pate and a delicious rabbit rillettes served with a garden of pickled treats. The White Russian had the special of roasted rabbit served with speck and white bean puree. I may have encouraged him to order it since, when do we ever have rabbit at home? He said it tasted like chicken. My baked figs with gorgonzola and prosciutto were a nice combination of sweet and salty, soft and crisp. Unfortunately we couldn’t fit in dessert without risking a food coma on the long 2 hour ride back to Sydney, so we gave it a miss. Instead we ordered a caffeine hit and scored some bittersweet chocolate tartlets to finish a splendid lunch date. 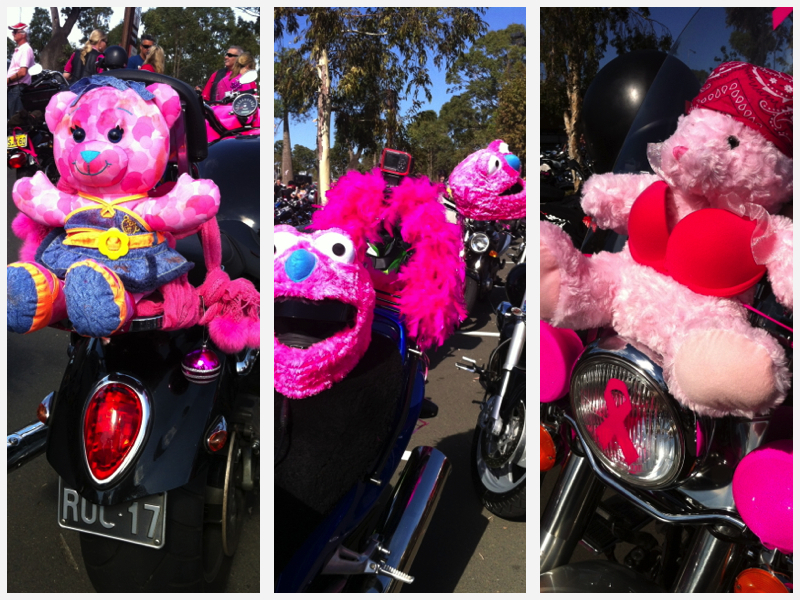 The annual Pink Ribbon ride came around again recently, and it was another fun day out on the motorbike with hundreds of fellow riders. The whole day is all about raising awareness and funds for breast cancer research, and it’s amazing to see the turnout for an event like this. 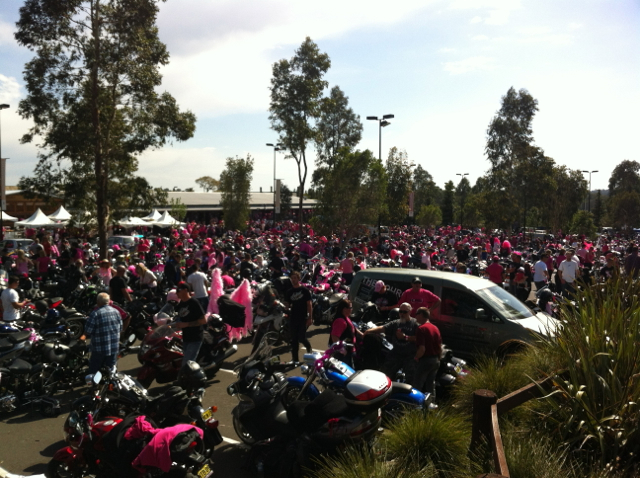 Even more fantastic is some of the hard work and effort some people put in to deck their bikes out in pink. It’s not so surprising to see tough-looking, hairy men in leather jackets with their facial hair dyed a shade of hot pink. It was quite a windy day, which did result in being blown around a bit on my little VTR 250. I guess I can chalk this up to increasing my riding experience, even though it really was not pleasant most of the time. 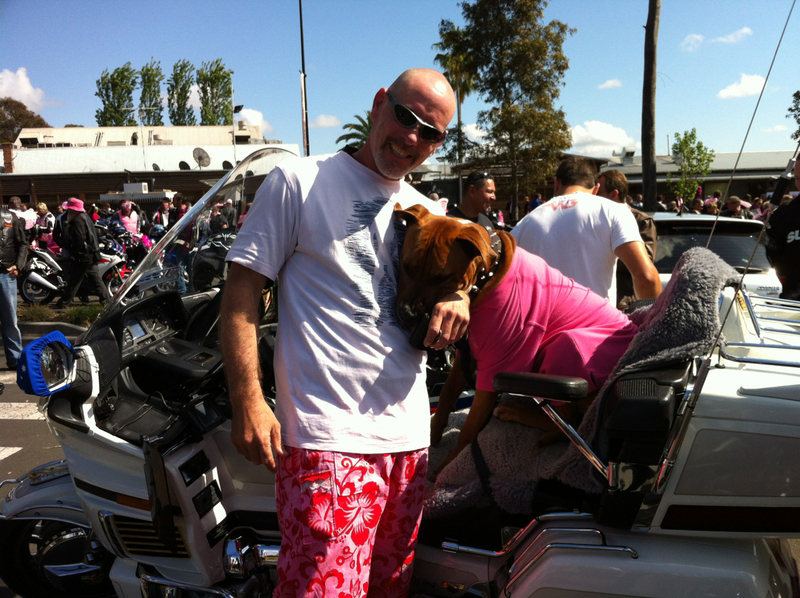 It’s really nice to be part of a community like this doing something good to help find a cure for breast cancer. Even better is to see men joining in with such enthusiasm! 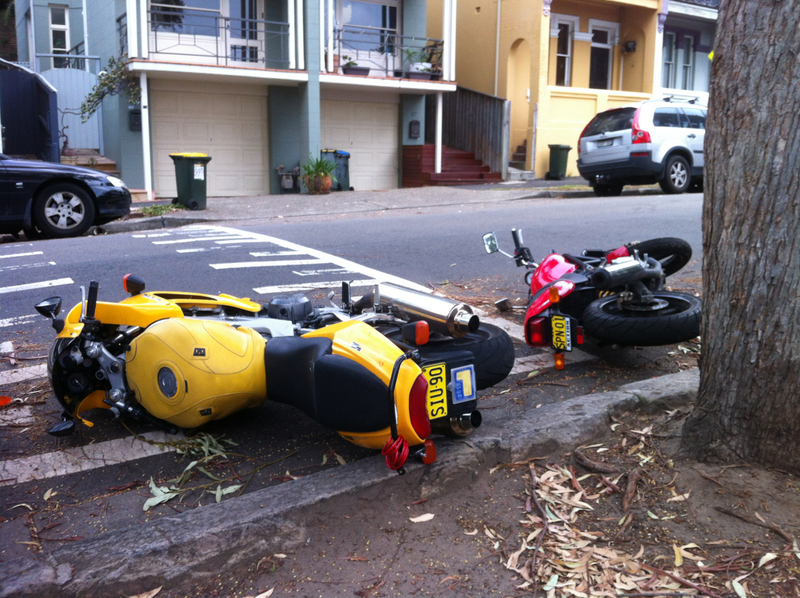 A few weeks ago, we woke up to our motorbikes both laying on their sides on the street outside our flat. They had obviously been victims of bored idiots who, during the night, thought that it would be hilarious to tip them over. It blows my mind that there are people out there who have no consideration for peoples’ property, and will damage property for the sake of a few laughs. It seemed that they were so intent on having their fun that they had even chosen to do it the hard way when they tipped them over the kickstands rather than the other side. Thankfully my motorbike didn’t sustain any more damage than I’d already inflicted on it recently (a snapped clutch lever when I dropped it a few days beforehand), however White Russian’s motorbike didn’t fare as well. It sustained cracked fairings, broken indicator lights, a snapped clutch lever, broken mirrors, and damage to the swing arm and the exhaust pipe. The upside was that his motorbike ended up being written off by the insurance company, so now he has some money to buy a shiny new toy! About 4 months ago, I bought my first motorcycle. I say the “first” because I’ve been reliably told by my biker friends that you never stay with your first ever bike. The longer you ride, the more you want to keep buying and riding bigger and better bikes, so you’re always looking for the “next” bike. I actually obtained my motorcycle licence in late 2009 while I was living in the UK. It was on a trip to Cornwall with my mate Graham, driving around the windy country roads, that I thought it would be a wonderful experience to ride around Britain. However, soon after I passed my test I embarked on my Central American backpacking trip and then never ended up buying a bike upon my return to London as I knew I would be soon moving back to Sydney. With a full riders licence, I was tempted to buy a big bike, but being essentially a rider with no experience I thought I’d just get a little bike and get confident before I upgrade. 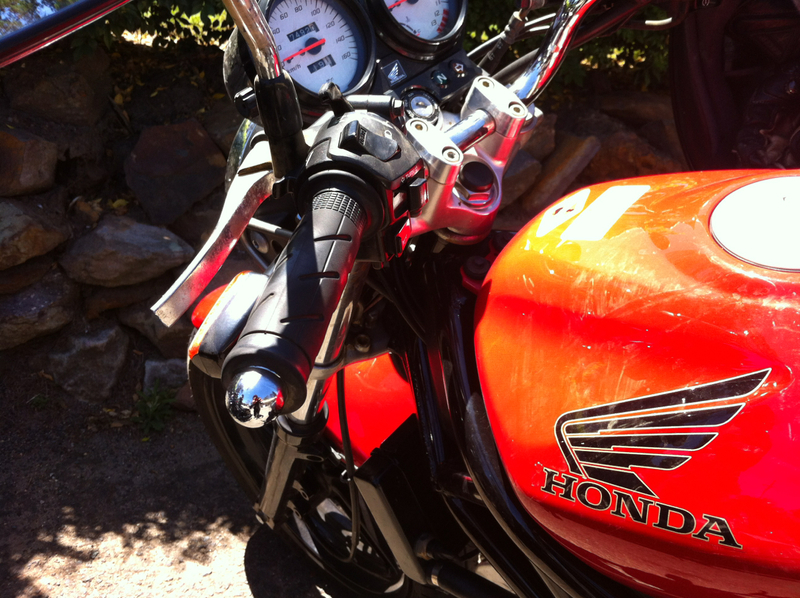 This is my sweet ride – my Honda VTR 250. 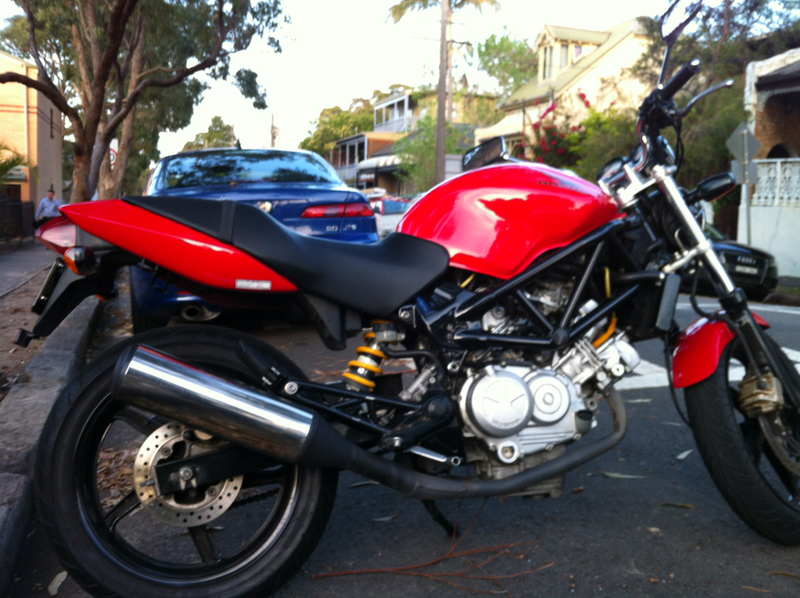 Looks a bit like a Ducati Monster! One of the best things about having a bike is taking the time to actually go out riding and checking out parts of Sydney that I would never bother to visit otherwise in a car. 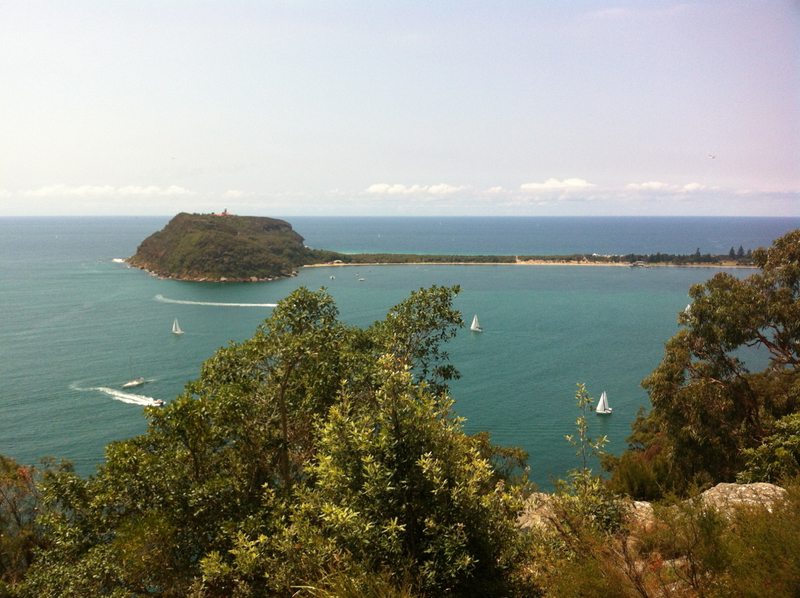 With Mark and my other biker friends, I’ve checked out Wisemans Ferry, the Royal National Park, the Old Pacific Highway north from Sydney, and just last weekend to Ku-rin-gai National Park to West Head to check out the view towards Palm Beach. Another great thing that I’ve discovered is a fun riding community. 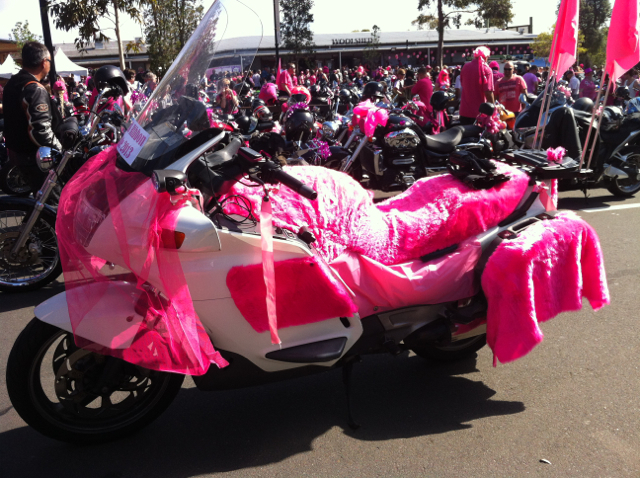 Last month was the annual Pink Ribbon ride, where riders of all descriptions come out and deck their bikes in pink all in the name of charity. 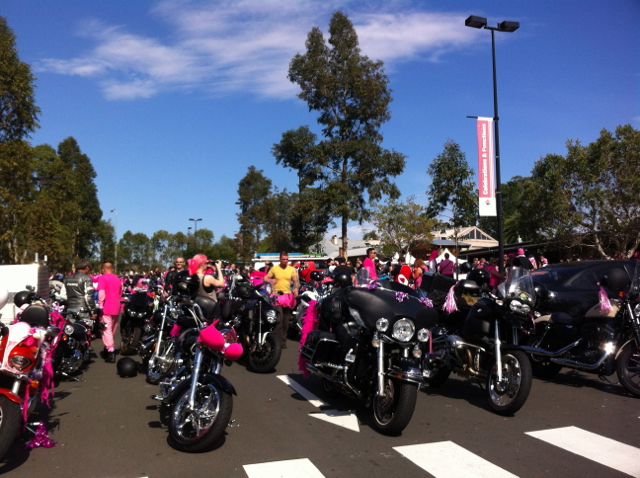 There are even some serious looking biker men with their goatees dyed pink! 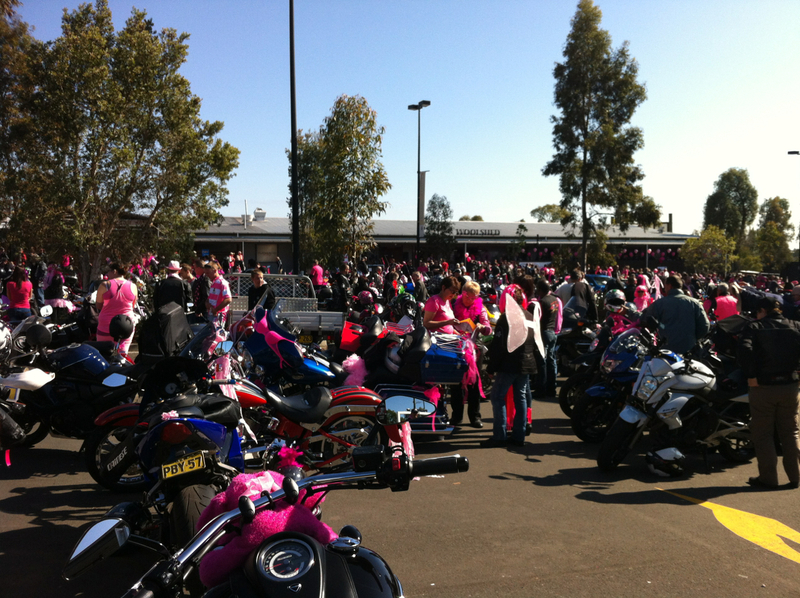 It was so much fun riding out in a big group of motorcycles. I think I’m seeing the appeal of joining a gang!